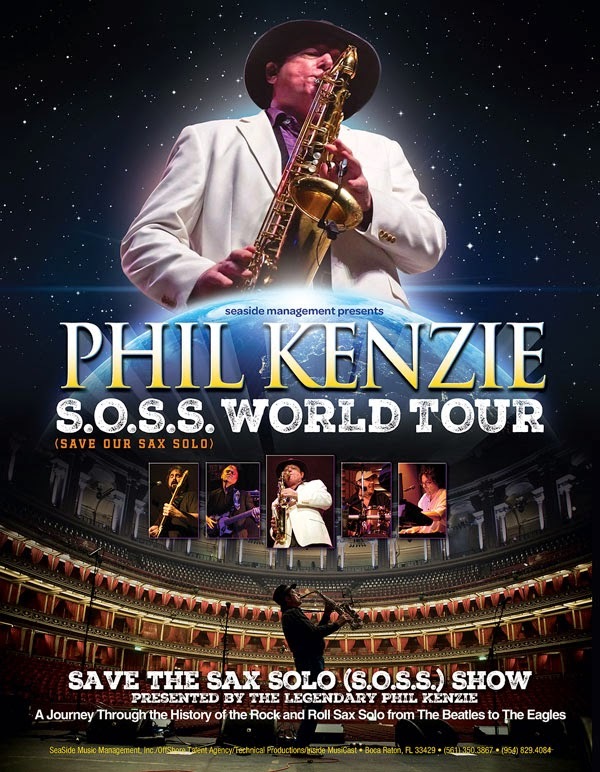 The Last Of The Great Rock Sax Players Phil Kenzie! Saxophonist With The Beatles, John Lennon, George Harrison, Paul McCartney, Al Stewart, Black Sabbath, David Bowie, Rod Stewart, The Eagles and many Others! Nashville, TN - With the recent passing of Bobby Keys, the last of the legendary rock sax players still remains - Phil Kenzie! Phil has the great distinction of playing sax on The Beatles legendary 'Let It Be' album! Along with The Beatles, Phil's impressive resume includes recording sessions and tours with such iconic music groups and artists as John Lennon, George Harrison, Paul McCartney, Black Sabbath, David Bowie, Rod Stewart, The Eagles and many others. It's easy to be familiar with Phil Kenzie's superb sax work. Just recall the soaring solos on Al Stewart's “Year of the Cat” or “Time Passages” still enjoying favored airplay to this day, or the punchy brass intro to “Jet” by Paul McCartney, or the inspired solo on “The Long Run” from “The Eagles Live” album. In fact, this gifted sax player/arranger has lent his masterful touch to hits by everyone from Rod Stewart to Jackson Browne, Stevie Nicks and Rosanne Cash to David Bowie, and in the process amassed some nineteen gold and platinum albums! Phil also holds the world record for the highest note ever played on Alto Sax on a solo on a top ten hit record (entry note on the first solo on “Time Passages” by Al Stewart). A documentary of Phil's incredible musical journey is in progress and is 99% finished. With 120 minutes in length, it is produced by Harry Jarvis an Independent video producer from Nashville TN. Now, much to the excitement of his fans worldwide, Phil is releasing a CD titled 'A Night With The Cat'. The album, recorded between 1998 and 2008, has never been released before and is an instrumental depiction of the lyrics/story of “The Year Of The Cat” hit single by Al Stewart, in which Phil plays the world acclaimed hit saxophone solo. Titles on Phil's new CD reflect the lyrics of the song. Phil is backed on 'A Night With The Cat' by Peter White “king of the soft jazz charts”and legendary session players Bob Babbitt and Larry Knechtal.